La Daille is the first of the Val d'Isère "hamlets" when arriving from the Tarentaise and, while the purpose-built apartment blocks aren't the most attractive introduction to the resort, the access to the skiing is second to none. The main skiing area here is to the right of the Bellevarde looking up the mountain.The La Daille bubble and the neighbouring chairlift link through to Tignes via the Tommeuses or Borsat chairs and also offer a good selection of cruising runs to start the day with - the blue Criterium or green (obviously!) Vert for those still warming up or the tougher OK World Cup run or Orange red runs. Note that these runs get very busy towards the end of the day. Intermediates will find a nice selection of green runs above the top of these lifts in between the Borsat and Grand Pré chairs. The other major lift in the La Daille area is the Funival funicular railway, which leads to the Rocher de Bellevarde and direct access into the village centre skiing. This is also the option for those who want to try the full length of the OK run or the interesting Diebold blue. One of the more popular off-piste routes, the Vallée Perdue ('Lost Valley') also descends to La Daille (given decent snow conditions) from near the base of the Tommeuses chairlift. 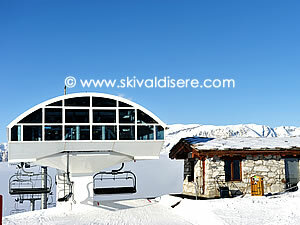 Oh, and for any beginners who have found their way to Val d'Isère there are two free drag-lifts near the accommodation. 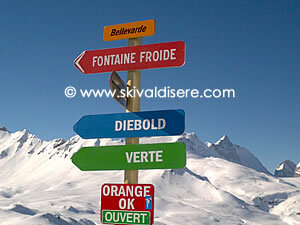 The Rocher de Bellevarde area can also be accessed from the central part of Val d'Isère - most usually via the Olympique cable car, although there is a longer open-air route via the Bellevarde and Loyes chairlifts which can be useful in busy periods. This side of Bellevarde is known for its challenging runs. The pièce de resistance is the old Olympic run down the Face de Bellevarde, a black run where conditions can range from pleasant to downright intimidating. Joseray is a red run option part of the way down. Bumps are frequently further over on another black, the Épaule de Charvet, while an alternative to that is the blue (and often crowded) valley run of Santons. Facing Bellevarde across the side valley is the famous Solaise, the second ski area accessible from the centre of Val d'Isère. Here at the base are a number of free lifts (draglifts and chairlifts) for beginners. Solaise also has a good beginner/low intermediate area up the mountain with the short lifts near the arrival point, the Madeleine runs and the slightly harder Glacier Express area. 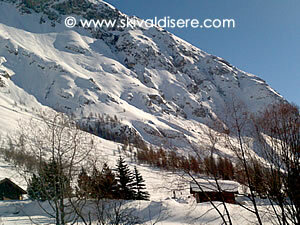 Access to the higher slopes is either via the Solaise cable car or the Solaise Express chairlift. On the journey up there is a chance to spy out conditions on the descents to the village and see how high the famous Solaise bumps are. There is a red 'M' route back to the resort amidst the cluster of blacks but really beginners and low intermediate skiers might be thinking about taking the cable car back down. There are two other options for good intermediate and advanced skiers with a couple of less-used lifts near the top of this area. The Cugnai chair has a decent red run back down under the lift and some off-piste dropping down the other side of the ridge, while the Manchet chairlift features the red Arcelles run and the 'Naturide' (meaning ungroomed black) of Marmottons. Le Laisinant is the linking ridge between Le Fornet and the Solaise but has come into its own with the construction of the chairlift up from the hamlet. It offers a selection of long and varied reds heading back down into the valley, with the option of some off-piste descents dropping to the lower 'L' blue run (note that the 'L' and, naturally, the off-piste can be closed due to avalanche danger). Off the other side of the ridge are the linking intermediate runs to the Le Fornet area, although this can also be reached from the valley between Le Laisinant and the Solaise by means of the Les Leissières and Tunnel (steep black) chairlifts. The hamlet of Le Fornet is not too far off 2000m to start with and this furthest-flung part of the area also has the highest lifts on the Val d'Isère side with the Cascade Express on the Pissaillas glacier heading up over 3100m. 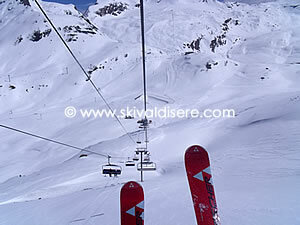 The Le Fornet cable car is the first stage up from the valley, followed by the Vallon bubble. This area is an intermediates' paradise with plenty of blue and relatively easy red runs here and further up on the glacier. Good skiers will enjoy it as well because of the generally good snow conditions at the higher altitude, although care should be taken as the higher parts are on a glacier and even skiing off the side of a piste carries the risk of crevasses. Those with proper experience, equipment and a knowledgeable guide can also take advantage of some of the prime long off-piste routes back from various points on the glacier to Le Fornet. The pistes back down to the village consist of a long blue (Mangard) and another of the unpisted black 'Naturide' runs (Foret). The black especially can be nasty in bad conditions - best to spy out conditions from the cable car on the way up.